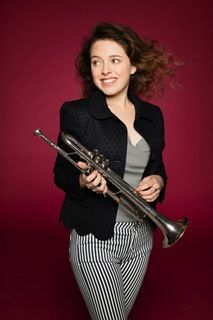 In their visit to Montreal’s Maison symphonique Friday evening, Quebec City’s chamber ensemble, Les Violons du Roy, under the direction of Associate Conductor Mathieu Lussier, featured the young French trumpet star, Lucienne Renaudin Vary. In 2016, the now 19-year old won the “Révélation” category of the Victoires de la Musique competition and since then has won first prize in every contest she has entered. For her debut in the province of Quebec she chose to play the two best-known trumpet concertos. All works on the program were premiered within a 13-year period–the earliest, the Overture to Così fan tutte, in 1790 and the latest, Hummel’s Trumpet Concerto, in 1803. The earliest work, Mozart’s overture, opened the evening’s program while the latest, Hummel’s concerto (apart from the encore), brought it to a close. Renaudin Vary played with a warm lyrical line, a finely-honed legato and close attention to nuance and detail. She is also a performing jazz artist. Beginning with the Haydn concerto, the first thing one noticed was her habit of prancing on the spot. It was as if she was unable to contain the leftover energy that hadn’t found its way into her playing. But it was clear that Renaudin Vary was one with her instrument. As the concerto progressed, she exhibited her masterful technique in the smoothly delivered trills and arpeggios–barely a hint of flutter, each note confidently placed. With the Hummel concerto, Renaudin Vary hit her stride–confident entries, velvety intonation and smooth transitions at all points of the dynamic range. The program also included Othon Joseph Vandenbroek’s Symphony in C Major, “La Prise de la Bastille”. As the program booklet noted, this work was formerly attributed to Karl Ditters von Dittersdorf. At the time, works by lesser-known composers were sometimes attributed to more popular ones to drum up sales. There would be little reason for an aristocrat like von Dittersdorf, however, to celebrate the storming of the Bastille! Lussier, in his comments from the stage, noted that the 32-member ensemble would do its best to evoke the “storming of the Bastille”, but if one wasn’t careful one may have missed it all together. It was played out quite early as the Allegro section of the first movement. As an encore, Renaudin Vary delighted the audience with a jazz rendition of what seemed to be the Gershwins’ “Someone to Watch Over Me.” The ensemble’s Overture to Così fan tutte was delightfully brisk and transparent.